Any pals who have read my novel Shackleton’s Man Goes South (Science Museum, 2013), will recall that one chapter détourns the former US Deputy Assistant Attourney General John C. Yoo’s now infamous so-called ‘Torture Memo’, 80-odd pages of dense and legalistic justification for the torture programme that underpinned former US President George W. Bush’s so-called ‘war on terror’, the details of which have now been laid bare by publication of the US Senate Select Committee on Intelligence or US SSCI’s Committee Study on the Central Intelligence Agency’s Detention and Interrogation Programme. ‘The Beatification of John C. Yoo’ was first published in 2012 as a standalone short ahead of the Science Museum’s publication of the novel, when I was ‘resident thinker’ for Alex Hartley and Situations’ Nowhere Island project. The story is derived for satirical purposes from then US Assistant Deputy Attorney General John C. Yoo’s memo from the Office of Legal Counsel in the US Justice Department to the US Department of Defense of 14 March 2003. 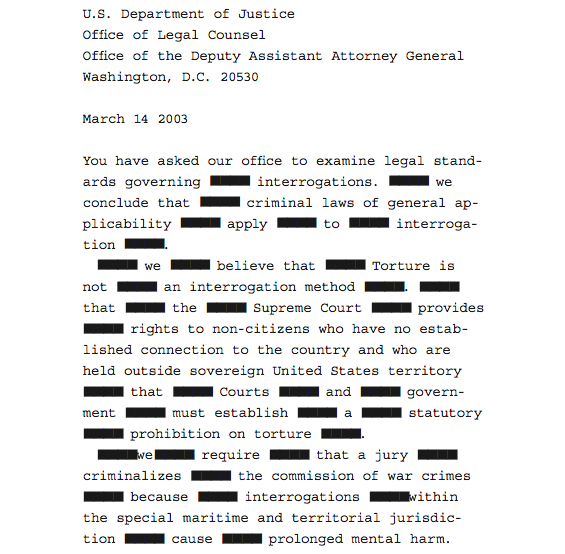 My text was produced by redacting around 99 per cent of Yoo’s original to create a new series of simple anti-torture statements in strict order of the appearance of their constituent parts in his original text and without any rewriting or insertions (this extends to capitalisations, italics, spacing and punctuation, which are all Yoo’s own) in repudiation of his chilling argument to the contrary. ‘The Beatification of John C. Yoo’ also yielded this riff, after Gertrude Stein. P.S. The aptness of this formulation after Stein is perhaps underlined by BBC News coverage of the Senate Select Committee on Intelligence’s report, in which there seems to have been a reluctance to use the word torture without qualification. Instead they say ‘CIA “torture”…’ (in inverted commas, in the headline of this article), or ‘tantamount to torture’ (in the introduction to the 10 O’Clock News, 9 December 2014 — no link). In another article published yesterday by BBC News, the official, euphemistic terminology of the time is used: ‘enhanced interrogation techniques’. In the same article — scroll down for a section entitled ‘Do the techniques constitute torture?’ — BBC News repeat the very distinctions made by John Yoo in his now widely reviled 2003 memo. Read ‘The Beatification of John C. Yoo’ on the Nowhere Island website. Download my novel Shackleton’s Man Goes South from the Science Museum website in ebook formats compatible with most devices. Sign up to receive my irregular newsletter, for news about forthcoming books and events.